I’m getting all excited now about my trip this weekend. I’m heading up to Edinburgh for a friend’s wedding and I’m going to get to catch up with a myriad of old friends, drink a rather large amount of wine and eat at all my favourite places. I’ve got that restless-can’t-settle feeling that causes you to clean your bathroom and hoover the entire house in an effort to keep busy. It also means that I’m neglecting the already mountainous amount of work I have to do (and the frightening amount that will await me when I get back) because I can’t concentrate. Not now. Not when there is so much excitement and anticipation in the air. It also means, in my case, clearing out the fridge and eating anything that might go off in the small time that I’m away. This amounts to a fair amount of food as it happens. I went a little crazy in the grocer last week and I’ve already gushed about how excited I was about the figs I found. (Obsessed much, me?) So the remaining two figs have been looking at me guiltily all week and I finally made them into breakfast yesterday. I didn’t need to go in to the office yesterday (one of the many joys of being a PhD student) and so I took my time over breakfast. I thought about the breakfast so much, I was even organised enough to start it the night before. Yes. I am that person. Anyway, starting it the night before entailed putting the oats into a bowl and covering in with milk before storing it in the fridge overnight to swell. Hardly an effort. The next day the oats was all silky and plump. I transferred the oats to a pan and heated it very slowly with a little extra water until it was cooked. Whilst that was happening I sliced my figs, drizzled them with honey and a little butter and baked them in the oven until they were falling apart and mushy. 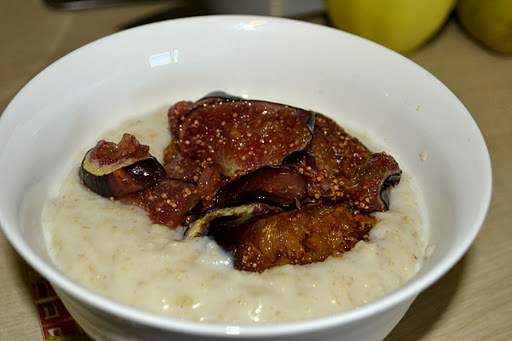 Queue figs onto porridge and heaven. In a manner of speaking. Totally winning start to the day. i have a series of very important questions. a) you live in a village? confusion, i thought you lived in nottingham. b)why on earth would you think everyone else isnt as obsessed with figs as you are? it must be one the great food combinations of all time, figs and balsamic. c)does your greengrocer sell squid heads? i am suffering from a severe salt and pepper squid craving and i cannot find them in my hick town, and d) whats with all the salad? eat a carb, already.